THE PERFECT FURLOUGH is slickly rigged comic froth from 1958, falling somewhere between ‘daffy’ and ‘zany’. Soldiers at a remote Arctic outpost have one of their number chosen to take the title leave (in Paris, with a movie star), on behalf of the others, to raise morale. 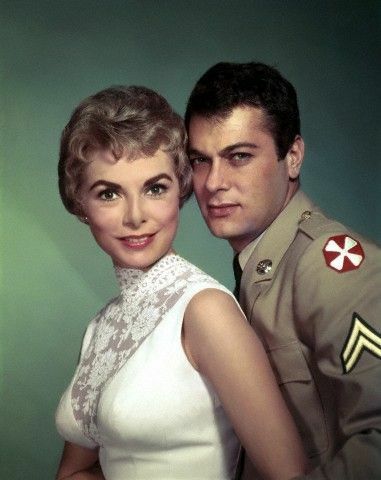 Since the star is Tony Curtis, guess which GI Joe goes on the trip? Never mind that cookie jar: you just keep your paws off that pepper pot! Curtis cons his way through another amiable bit in another period comedy with limited shelf-life. 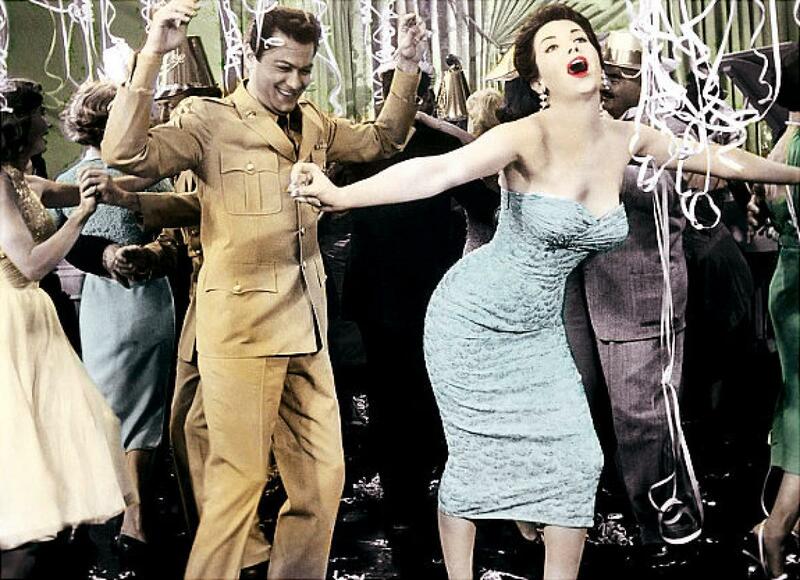 Linda Cristal as the curvy, vervy glamour rep, has a few funny moments. Janet Leigh plays prim, Keenan Wynn, Elaine Stritch and the rest mug, smirk or wince as per farce rules under direction from Blake Edwards. Helpless but harmless 93 minutes. With Les Tremayne, King Donovan, Marcel Dalio, Jay Novello, Gordon Jones, Alvy Moore, Troy Donahue and Carleton Young. At 38th place for the year, it earned an easy $6,600,000. At 33, Curtis was having a ’58; along with this he enjoyed a moderate success with Kings Go Forth and two big hits in The Vikings and The Defiant Ones. The last brought him his only Oscar nomination. His marriage to Janet Leigh was in Year Seven, with four to go. Twenty-four year old Argentinian beauty Linda Cristal was getting pushed as the “Pepper Pot of the Pampas”—you have to hand it to publicity flacks. She also was named “Motion Picture Sweater Queen of 1958” by the Knitted Outerwear Association of America (I’m glad I found out there was such a thing). Two years later, Linda would be The Duke’s leading lady in The Alamo, and her pepper-pot days retired, fully paid up on their dues. 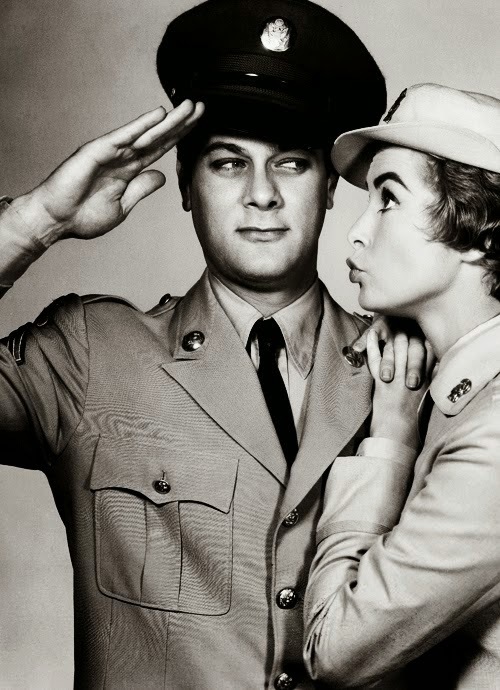 For some reason, service comedies were big in ’58; aside from this film and South Pacific, on tap were Imitation General, Me And The Colonel, Onionhead and best of the lot, the huge hit No Time For Sergeants. Plus, Elvis went into the Army! Maybe it was the ratchet-up of tension between Ike & Nikita (Eisenhower & Khrushchev, for you whippersnappers) that brought on these attempts to chuckle away draining the budget? I wonder about this, not merely to pad a blurb about an insignificant comedy that’s probably #4000 on your list of must-see’s. I do it so you don’t have to—because that’s the kind of pal I am. Of course, if we were competing for a weekend in Paris with Linda Cristal, then you would find out who you were really dealing with….